For the Spanish dish, see Spanish omelette. For the Mesoamerican maize (corn) tortilla, see Corn tortilla. For the South American tortilla, see Sopaipilla. For other uses, see Tortilla (disambiguation). The wheat flour tortilla was originally derived from the corn tortilla, a bread of maize which predates the arrival of Europeans to the Americas. It is made with an unleavened, water based dough, pressed and cooked like corn tortillas. In Spanish the word "tortilla", without qualification, has different meanings in different regions. In Spain it is an omelette; in Mexico and Central America it is a corn tortilla; and in many other places a flour tortilla. Flour tortillas are commonly prepared with meat, chopped potatoes, refried beans, cheese and other ingredients to make dishes such as tacos, quesadillas and burritos (a dish originating in the Ciudad Juarez, Chihuahua, Mexico / El Paso, Texas area). The wheat flour tortilla is probably best known as the tortilla and it is used to make burritos, amongst other things. 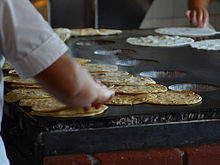 Wheat tortillas have also become a staple of both northwestern Mexican states (such as Sonora, Sinaloa and Chihuahua) and throughout the Southwestern United States. Soft wheat tortillas use wheat instead of masa as the primary ingredient. The Mission Foods brand lists the following ingredients: Enriched Bleached Wheat Flour (Wheat Flour, Niacin, Reduced Iron, Thiamine Mononitrate, Riboflavin, Folic Acid), Water, Vegetable Shortening (Interesterified Soybean oil, Hydrogenated Soybean Oil and/or Palm Oil), contains 2% or less of: Salt, Sugar, Leavening (Sodium Bicarbonate, Sodium aluminum sulfate, Corn starch, Monocalcium phosphate and/or Sodium acid pyrophosphate, Calcium Sulfate), Distilled Monoglycerides, Enzymes, Wheat Starch, Calcium Carbonate, Antioxidants (Tocopherols, Ascorbic acid, Citric acid), Cellulose gum, Guar gum, Dough conditioner (Fumaric acid, Sodium Metabisulfite and/or Mono- and Diglycerides), Calcium propionate and Sorbic acid (to preserve freshness). The word "tortilla" in these countries is used to refer to the ubiquitous corn tortilla. made of maize. In Mexico burritos are made with wheat tortillas. Flour Tortillas were also very popular in Tex-Mex food and plates like Fajitas. Flour Tortilla with Bean and Eggs was very popular in northern Mexico and in the Southwest. The origin of the flour Tortilla was Northern Mexico and this is why so many plates are made with it like Quesadillas as well as Burritos, Chimichangas and Fajitas served with Flour Tortilla and Bean Taco or Chorizo Taco. The Flour Tortilla is the sister to the Corn Tortilla which was created first. From Mexico City Southward the Corn Tortilla is more popular but in Northern Mexico where the Flour Tortilla originated the Flour Tortilla maybe just as popular if not more popular than the Corn Tortilla. Honduras is well known for using wheat flour tortillas to make baleadas, which consist of a wheat flour tortilla, folded in half, with various items (beans, cream, scrambled eggs) put inside. Maize and wheat tortillas can often be found in supermarkets in El Salvador and Costa Rica produced by Mexican companies. Tortilla art is the use of tortillas as a substrate for painting. Tortillas are baked and then covered in acrylic before they are painted. Tortillas in Central America sometimes differ somewhat from their Mexican counterparts, although are made similarly. In Guatemala and El Salvador, the tortillas are about 5 millimeters thick and about 10 centimeters in diameter, just like Mexican gorditas. Like the Mexican tortillas, the maize is soaked in a mixture of water and lime (or lye), then rinsed and ground. In El Salvador, they sometimes use sorghum (called maicillo there) to make tortillas when there is not enough maize. Also in El Salvador, there is a particularly large and thick tortilla called a "chenga" on top of which food is placed, like an edible plate, to serve food to the labourers in coffee plantations and farms. Tortilla chips — made from maize tortillas cut into wedges, then fried — first gained popularity in the 1940s in Los Angeles, California and were mass-produced there. The ingredients in maize tortillas are maize, lime, and water. Fried chips add salt and vegetable oil. Flour tortillas are also used to make fajitas, wraps, sandwiches, casseroles and stews, and there are numerous other uses. Many people from both Northern Mexico and throughout the Southwestern United States eat tortillas as a staple food. Many restaurants use wheat flour tortillas in a variety of non-Mexican and Mexican recipes. Many grocery stores sell ready-made tortillas. ^ Rubios, Fresh Mexican Grill. ^ Hernán Cortes: From Second Letter to Charles V, 1520, From: Oliver J. Thatcher, ed., The Library of Original Sources (Milwaukee: University Research Extension Co., 1907), Vol. V: 9th to 16th Centuries, pp. 317-326. ^ Canfield, Lincoln. University of Chicago Spanish Dictionary, 4th Edition. ISBN 0844278521. Introduction. ^ "Tortilla Statistics and Trends". Aibonline.org. Retrieved 2012-08-06. ^ "Mission Flour Soft Taco 10ct | Mission Foods". www.missionmenus.com. Retrieved 2018-04-22. 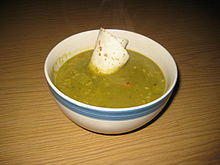 ^ Food For Space Flight NASA. Retrieved: 2012-09-08. ^ California Mexican-Spanish Cook Book; Selected Mexican and Spanish Recipes, by Bertha Haffner-Ginger, Citizen Print Shop, Los Angeles, 1914. ^ Tackling the taco: A guide to the art of taco eating, by Sophie Avernin, Vuelo Mexicana. ^ "Cultivarán el maicillo para producir miel: 8 de Agosto 2005 .::. El Diario de Hoy". Elsalvador.com. Retrieved 2012-08-06. ^ "Ortega Flour Tortillas". Ortega. ^ Ramona's Spanish-Mexican Cookery; The First Complete and Authentic Spanish-Mexican Cook Book in English, by Pauline Wiley-Kleemann, Editor, West Coast Publishing Co., Los Angeles, 1929.